Born in Swansea in 1955, Vivienne Williams left Wales to study English Literature at Reading University, gaining a Master’s Degree in 1978. She spent the next five years abroad teaching English in Italy and working at an Art Gallery in Sydney where she began selling her paintings. 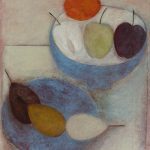 On her return to the UK in 1983 she spent seven years studying and working in a Buddhist community which had a profound effect on her development as a painter. 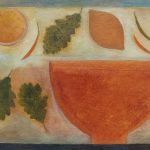 As Andrew Green, the former Head of the National Library of Wales writes, her paintings ‘possess a determined search for harmony: not just a visual harmony, but a corresponding human harmony, a learned stillness of mind. Vivienne has long been influenced by Tibetan Buddhism, which emphasises the importance of achieving tranquillity through removing mental obstruction. Her paintings are more than self-complete formal compositions. They do hold an intent, for those open to their invitation’. Vivienne’s work focuses on still-life. It relies on subtle colour tones and depth of surface and texture achieved through multiple layers of paint. She uses a restricted repertoire of forms giving a sculptural presence to the objects by eliminating detail and placing the objects in changing harmonic relationships where the negative space between the objects is as significant as the forms themselves. Vivienne has built a reputation as an established artist with regular solo exhibitions in Swansea, Cardiff and London. She was a prize-winner at the National Eisteddfod in 1993. 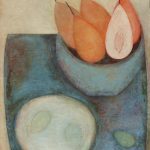 She received a highly commended prize at the inaugural Welsh Artist of the Year competition in Cardiff in 2000 and was on the panel of judges in 2008. 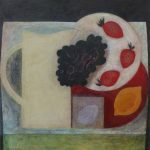 Her work has been purchased by the Contemporary Art Society of Wales and can be found in many Public and Private Collections to include: Carmarthen County Hall, Swansea University Library and the World Trade Centre, Cardiff.